In its simplest sense, acupuncture is the treatment of conditions or symptoms by the insertion of very fine needles into specific points on the body in order to produce a response. 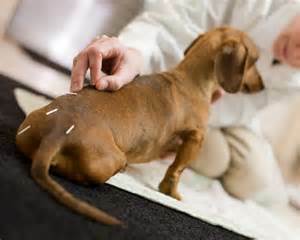 Acupuncture points can also be stimulated without the use of needles, using techniques known as acupressure, moxibustion, cupping, or by the application of heat, cold, water, laser, ultrasound, or other means at the discretion of the veterinary acupuncturist. Acupuncture is an ancient form of medical treatment, and is believed to have possibly originated in India at least 7000 years ago. The development of acupuncture into the extraordinarily effective treatment tool it is today probably began in the earliest dynasties of China. Jesuit missionaries brought acupuncture to Europe from the Orient in the late seventeenth century, where it has continued to be used in varying degrees. In North America, the use of acupuncture outside of Asian-American communities was infrequent until the early 1970s. As more and more clinical research has been conducted showing positive results in treatment of both humans and animals, the use of acupuncture has increased. In North America, acupuncture as an organized form of veterinary medicine has been in existence since approximately 1975, when the International Veterinary Acupuncture Society (IVAS) was founded. IVAS conducts regular courses, seminars, and conferences, and has established high standards for assessing the competency of practitioners through an accreditation program. Here at Ahwatukee Animal Care Hospital, Dr. Jeffrey Jenkins completed an extensive postdoctoral training program in veterinary acupuncture at Colorado State University College of Veterinary medicine and is certified in veterinary acupuncture. Dr. Jenkins is an experienced veterinary acupuncturist and treats patients on a regular basis using both traditional western veterinary medicine as well as acupuncture and other alternative therapies. Because of the differences in anatomy, and the potential for harm if treatments are done incorrectly, only a properly trained licensed veterinarian certified in veterinary acupuncture, like Dr. Jenkins, should perform acupuncture on animals. Acupuncture can be used on all species of animals, and has documented efficacy on a wide range of species, including dogs, cats, and rabbits. Most animals tolerate the treatments very well. The specific acupuncture points have been well charted for animals, and were conceptualized by ancient Chinese scholars to be connected with each other and various internal organs via meridians or channels. Many of these channels trace the paths of the body's major nerve trunks. Each acupuncture point has specific actions when stimulated. Combinations of points are often stimulated to take advantage of synergistic reactions between them. 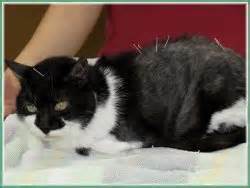 Which acupuncture points are stimulated, the depth of needle insertion, the type of stimulation applied to the needles, and the duration of each treatment session depends on the patient's condition, tolerance, and the experience and training of the veterinary acupuncturist. There is evidence of the success of veterinary acupuncture for treating disorders of the reproductive, musculoskeletal, neurologic, pulmonary, gastrointestinal, and dermatologic systems. The most common conditions that are treated include traumatic nerve injuries, intervertebral disk disease, degenerative myelopathy, epilepsy, and other central nervous system disorders; asthma, allergic dermatitis, lick granulomas; and chronic pain such as that caused by degenerative joint disease. Acupuncture is also useful as an adjunct therapy to control vomiting associated with chemotherapy, to manage post-operative pain, and to speed healing after injuries. In some cases, it may reduce or eliminate the need for chronic medication. Further, acupuncture can be used in conjunction with general anesthesia, allowing decreased doses of drugs such as analgesics. If properly applied, acupuncture may even eliminate the need for surgery in certain conditions. Any condition may potentially benefit from acupuncture. The success of the treatment of chronic conditions will vary according to the disorder being treated, the general health condition of the patient, the number and frequency of treatments, and the skill of the practitioner. The earlier in the course of the disease that acupuncture is started and the more numerous and frequent the treatments, usually the better the response. As a rough guide, about 1/4 of patients with chronic conditions show major improvement, 1/2 show significant improvement, and 1/4 show some mild to little improvement. Acupuncture should never be administered without a proper veterinary diagnosis and ongoing assessment of the patient's condition and response to prior treatment. 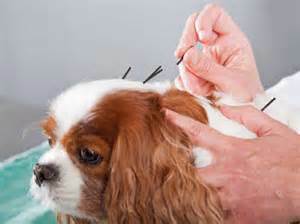 In the hands of a knowledgeable veterinary acupuncturist, adverse reactions are rare, but may occur. Such reactions may include mild transient bruising or swelling at the needle insertion site; a mild worsening of the condition for a short time (usually 24 to 48 hours); difficulty removing needles due to a muscle spasm; an infection at the needle site; injury to underlying tissues or organ. 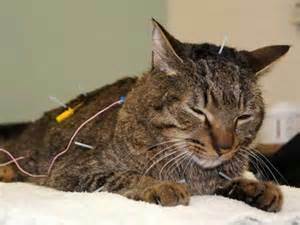 Certain acupuncture points are contraindicated in pregnant animals. Caution is exercised if certain drugs such as narcotics or corticosteroids are being used, or if the animal has a clotting disorder. In general, acupuncture can be very effectively combined with most conventional and alternative therapies. Certified veterinary acupuncturists have the knowledge and skill to understand the interactions between different forms of treatment and to interpret the patient's response to therapy. To learn more about acupuncture, please visit our Acupuncture page.